Tiny Brains actually caught me off guard. I'd heard of it, but for some reason glossed over its announcement a couple months back. My mistake. Luckily, we had some hands-on time today at E3 and put the action puzzler through its co-op paces. You play as four creatures who have been experimented on long enough that they developed super powers. I didn't catch if they had actual names in our time, but the press materials call them Force, Create, Teleport and Vortex. Force can push things with telekinesis, Create can make walls of ice, Teleport can swap positions with objects and Vortex can pull objects to himself. Once the experiments begin, our foursome set out to solve puzzle rooms, with some light survival/combat objectives thrown in. Each character's power is physics-based, which adds an air of unpredictability. The puzzles are all designed around creative use of the foursome's power set, and most rooms have several ways of solving them. We didn't witness it in our demo time, but if players drop in or out of a session, the puzzles dynamically shift themselves to make the solution possible to complete. After you've finished the campaign, a series of challenges should extend your playtime. We were shown three today. The first had our heroes attempting to retrieve a battery from a platform far out of reach - our team solved it as follows: Create summoned an ice block, Teleport jumped on it, Force pushed the block out over the gap, Teleport swapped positions with the battery, and Vortex snatched it out of mid-air. Solid. Other challenges had us attempting to keep a rolling ball in the center of a moving platform as long as possible while the edges constantly tilted and crumbled, and the last one asked us to keep pushing a ball uphill through a twisting cylinder made of breakable glass, barriers and filled with treacherous holes. Spearhead Games has clearly done their homework as to what makes a solid co-op experience. Hopefully the final game will encourage as much creative co-op interplay as our time with it did. 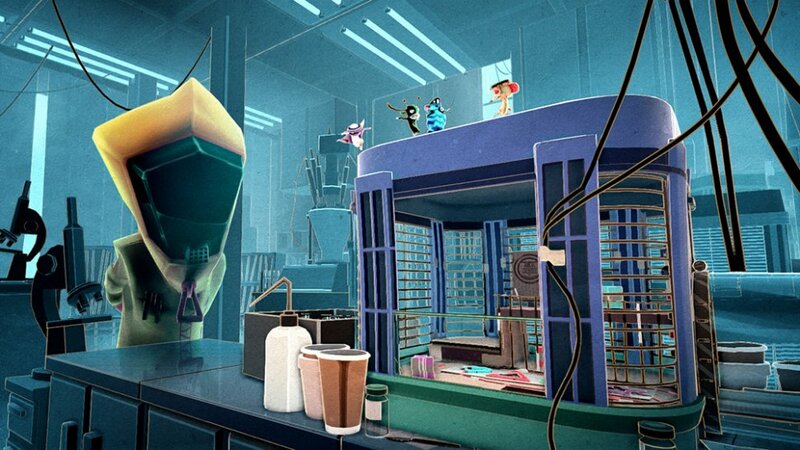 Tiny Brains will features four-player local or online co-op, and will be coming to PC, Xbox 360 and PS3 this Fall, with PS4 and Xbox One versions to follow. Page created in 0.3893 seconds.